Disco Roller Skating in a “Secretly Awesome” Spot! Whether or not you’re into disco roller skating (and I sincerely hope that you ARE! ), this abandoned church-turned roller rink is worth checking out! 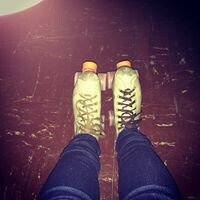 $10 admission fee + $5 skate rental (or bring your own). Disco roller skating attire encouraged. Toot-Toot! Hey! Beep-Beep!